This curtains are very well made, excellent quality and give a classy look to my living room. They block 100% of the light when closed. Wonderful buy for the money! 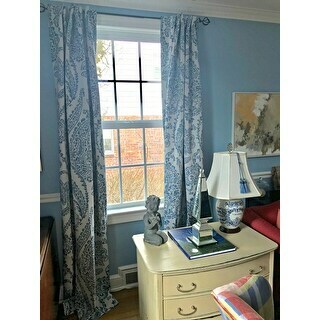 Create a soft and regal window when you hang these Tea Time China blue blackout curtains from Exclusive Fabrics. These patterned curtains shield you from the light without making your room feel dim and drab. Dimensions 84.0 In. X 50.0 In. X 0.25 In. These are gorgeous. Considering the price, I was worried they would be a very thin cotton. I can’t believe how heavy they are and very expensive looking - they look like custom designer curtains. They block out the sun and will keep out drafts too. I love the colors but you should know before purchasing that the background is not white - it is sort of a very pale grey. This works well with my decor so I’m fine with it - but if you’re going for a more summery type feel you may not like the background color. They really dress up my living room. Couldn’t be happier and the price was amazing. 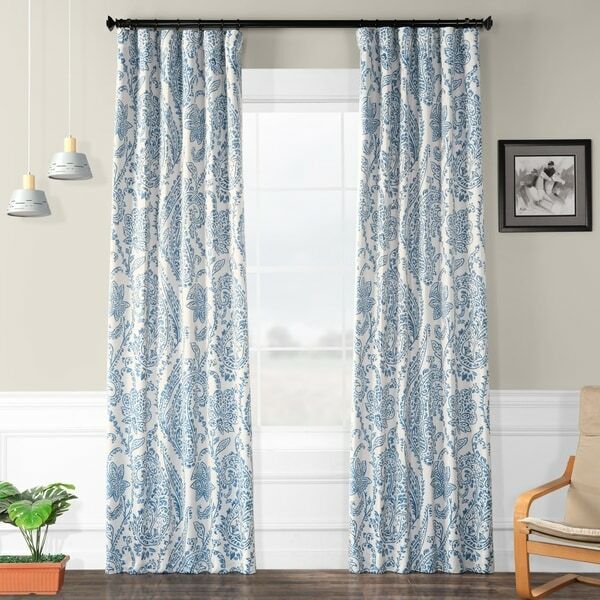 The Exclusive Fabrics Tea Time China Blie Blackout Curtain Panel Pair is a lovely and affordable set of curtains. The background is a tea-stained color. I was expecting more of an off-white or cream background, bulgur they are quite nice and fit the guest room, perfectly. Having purchased blackout curtains for my children’s bedrooms in the past, I was apprehensive about the quality and look of these curtains. However, any uncertainty dissolved once they arrived. 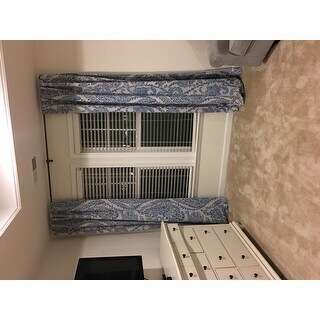 The curtains are well made, with hanging options sewn right into the top. At first, I hung them in the back-tab loops. However, closing them on a nightly basis to keep the draft from the window out, I ended up hanging them with rings for easier sliding. 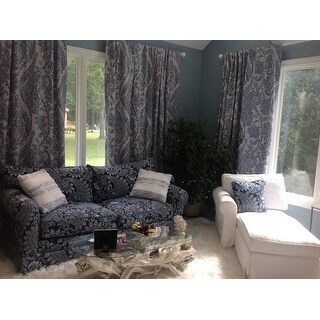 These curtains have the look of high quality, elegant drapes at a great price! When closed, they really do blackout any light and offer a good degree of thermal protection, too. I highly recommend them! 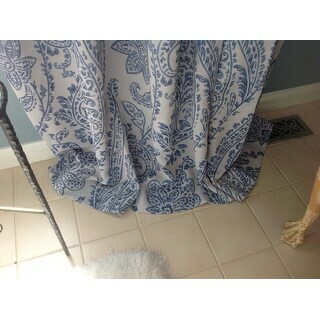 These are very well made drapes with rod casing and back tab options and weights in the hem. I was impressed! They do a great job of blocking light. I gave them only 4 stars because the pattern is much larger than the image shows in the picture and the design is printed, rather than woven, onto polyester that feels slick. The background color is also a bit off. It's more of a bluish white than the cream my computer showed it to be in the pictures. My bedroom where I have hung them is quite small. These are best for a larger room. I haven't decided if I'll keep them. I am very pleased with these curtains. 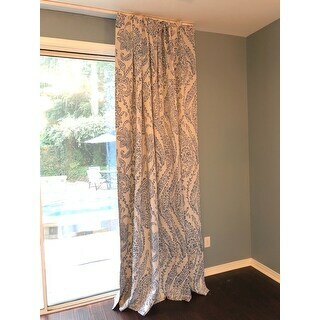 They look and feel like very high quality curtains, but the price is much more budget friendly. 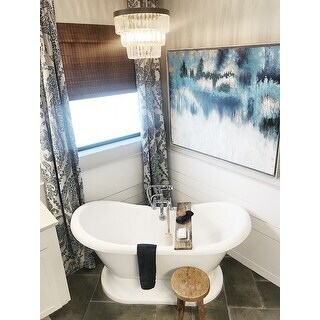 The background color is less a bright white and more a soft gray as other reviews also describe, but I paired them with white sheer curtains, and they look beautiful together. The length is consistent on all the panels, and the pattern matches from panel to panel, which looks very polished when they are closed. They hang beautifully, and the color and pattern is very elegant looking in our dining room. I just received these drapes and hung them immediately! (I temporarily tacked them up until my husband can hang the rod.) I absolutely LOVE them! The fabric is rich and smooth, very high quality. I love blue and white so these are right up my alley! I understand what a previous reviewer meant when she said they have a grey background, however I choose to see it as a cooler off white. I feel that it compliments the blue. I am also thrilled with the room darkening aspect. As soon as I hung them, the room immediately seemed dimmer. I really needed this as the sun comes directly through that window first thing in the morning. 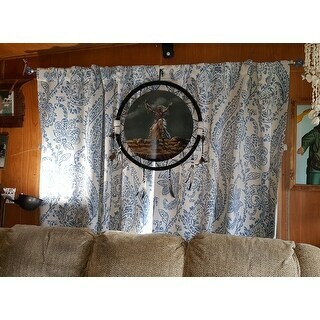 I would highly recommend these curtains! Beautiful! quality feeling fabric and quality stitching. The corners are weighted which makes them hang perfect! The colors are a pale gray and the blue is in between Navy and royal blue. 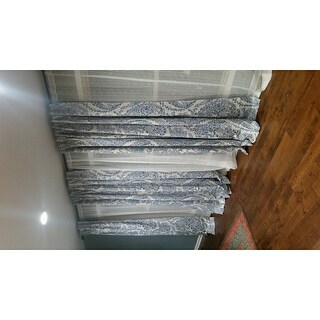 Quality curtains at a great price! It is always a surprise when you open a box containing something you bought online without really seeing. These curtains in my box exceeded my expectations. I did not expect that they would feel like satin. I did not expect that the China Blue would be as seen online, but it is exact. 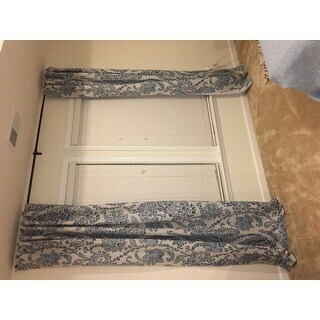 These curtains are excellent quality and well made. The only disappointment I have is I will have to paint my bedroom walls because they do not look good with white, but will look perfect with pale grey. These are my favorite purchase so far.I bought them for my sun porch and although I haven't put them up yet, the material is soft but heavy and well-made and the design is beautiful. The colors look just like the picture. Update- I have enjoyed these curtains for the last 2 months and can't say enough about them. They are heavy, soft, beautiful and the quality is excellent. The "weights" hold them in place such that they drape beautifully always. Everyone comments how beautiful they are and are astounded that they are not custom made. My interior designer friend says that my sunporch looks like a designer room. That is primarily because of the cartons. Highly recommend! First off Ive seen these on other sites for a single panel and more expensive than I paid for two. The white is very light making it look like a creamy gray but not too gray. The blue is just like photo. They are heavy and great quality. Great curtains - I didn’t realize the backgrpund was more greyish - but that worked even better for me! Love them. They brighten up the room and kee]the sun from shining onto our t.v. . They were heavier than expected, so will keep out the drafts in winter. I am very pleased with the color and the look.I believe they will last a long time. These curtains are beautiful! They are very well made and look very expensive. I could not be happier with my purchase. The curtains are light enough where they cascade beautifully to the ground, achieving the exact look I was going for my delicate dining room. They are well lined so no one can see in at night. I would recommend these to anyone! Good quality. It's a print on a nice fabric. Keeps the light out. We have a wide, about 129" window and I hung 4 curtains and it covered nicely. Very nice, thick and block all the light! I ordered this in the yellow...the color is much more muted than the picture. The background white is more of an off white and the yellow is more of a goldfish,yellow...I actually like the muted colors better and they go well with my color scheme which is autumn warm & Tuscany colors. The fabric is very soft to the touch. I love the colors and the fabric! These curtains are very well made. They are nice heavy curtains that darken our room for guests when needed. We used two curtain panels on each side of our large windows. I love these curtains. They are a true blackout curtain. I originally ordered these for my living room and I liked them so much that I ordered a second pair for my dining room. However, they sent the wrong pattern and I had to contact customer service. They sent out the correct order right away. I did not have to wait for them to receive my return. I am very happy with these but only gave it four stars because of the wrong pattern sent. Better quality fabric and heavier than what I've seen in most big box stores. Did not need to be ironed and are just beautiful. I was very pleased with these for the price. 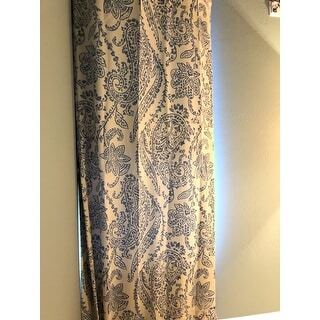 Beautiful pattern and fabric, quality looking curtains. Not very thick and completely light blocking though. 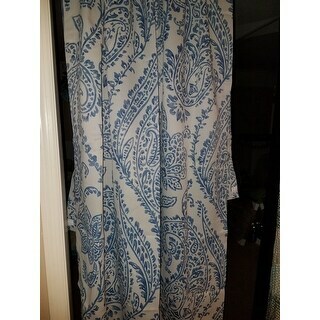 These are a good price for decent quality, but the paisley pattern was much more grey/blue than pictured. They're on the heavier side, so would do a good job with light blocking if that's what you're after. 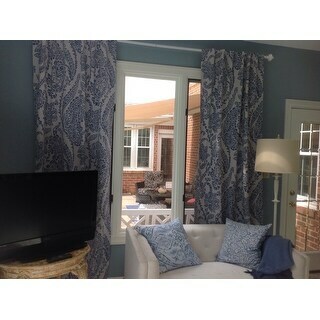 Very nice, the material is heavy weight and hangs/drapes perfect. "is the brown color still available ?" Yes, that would be the "Tea Time Ochre" option. 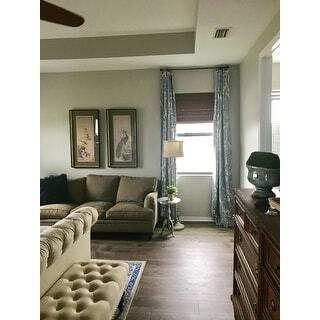 "Are there 2 curtains panels (each one 50" x 108") in the package for the noted price?" Yes, this contains two panels. "Am I still able to purchase the yellow option anywhere?" More will be available around Aug. 6th. "Do you have bedding sets that will coordinate or compliment these curtains? Which one(s)?" There is not a matching bed set. "Is each panel 50” or is that the width of both panels combined?" Each individual panel measures approximately 50 inches wide. "Could I put curtain pins and hang them with hooks?" Yes, pins can be inserted directly into the header. "How long until the 84” are back in stock?"